Once in a while we get Chinese take-out… There is ALWAYS a few containers of rice left over! Instead of throwing it away, I make fried rice for dinner a few nights later. 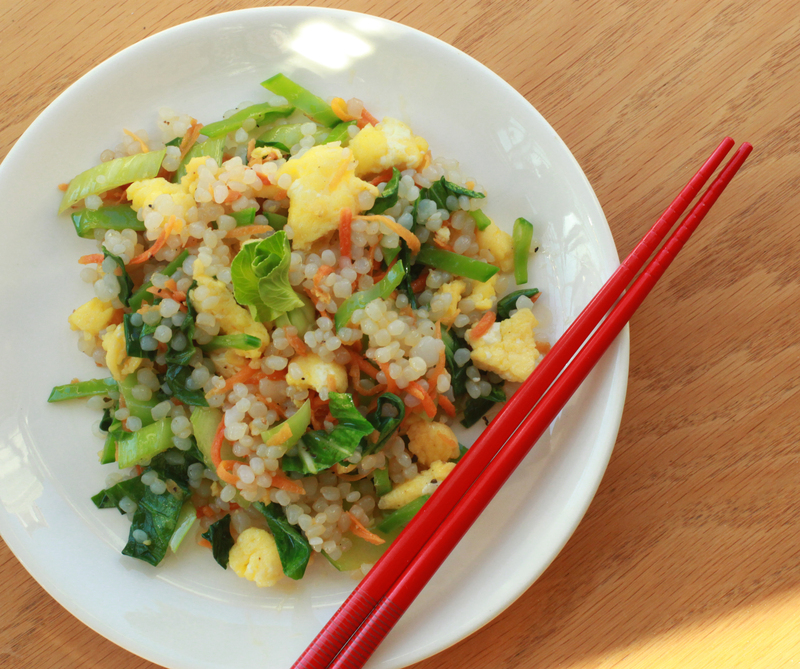 The best fried rice is made with at least day-old rice and it needs to be cold. It’s a great way to use up vegetables, frozen or fresh and you can add any protein you like. I always include eggs, sometimes I like to add shrimp. I was so excited when I saw the package of Miracle Rice at my local Whole Foods. While Chinese take-out is usually a rare, last-minute decision, in this case I actually planned take-out just so I could make this for Charlotte. It turned out so good, and as you can see from the picture, it was nearly identical to our fried rice. I chose to use bok choy, snow peas and carrots… the bok choy adds a lot of “bulk” to the meal. Also, most of the fat is cooked into the scrambled eggs so this was not sitting in a pile of oil. There was barely even enough oil remaining on the plate to scrape when she was finished. If you have not tried or liked the Miracle Noodles, I would recommend starting with the rice. The texture of these products can be like eating a rubber band, however since the rice is so small, and many other foods were added in, the rubbery texture was not as prevalent. Weigh the raw egg and mix the oil into the egg very well. Add the butter to a small 8-inch non stick pan and melt on medium heat. Scramble the egg and oil mixture in the melted butter. Remove the cooked egg from the pan and place it directly on top of the prepared Miracle Rice. There will be extra oil and butter remaining in the pan. Add the veggies to the same pan and sauté them in the remaining butter and oil. Cook them to your liking. Remove the veggies from the pan and place them on top of the eggs and rice. Scrape all of the fat out of the pan onto the fried rice. Add the soy sauce, macadamia nuts and the seasonings to the fried rice and stir the mixture around to evenly incorporate all of the ingredients. You can use any protein you want. Firm tofu, cooked chicken and even baby canned shrimp would be good options for kids. Change the vegetable to suit your preferences. Peas and carrots are familiar to most kids, but green onions, red bell peppers, and shiitake mushrooms would also be great additions. The macadamia nuts are not traditional or necessary to the recipe. You can use more oil if you don’t want to use nuts. I included them because I like the added crunch. In the family version of fried rice, I often like to add cashew nuts. This is a great option to bring to a chinese restaurant if you want to eat out!